"327 out of every 1000 Indians above the age of 15 have never had any formal schooling. Of the remaining 673, only 20 dropped out during primary school. Once we got kids into primary school, we managed to make sure that they completed it. In secondary school, however, the situation is markedly different. 465 out of every 1000 Indians made it to secondary school but 394 dropped out without completing. Only 58 made it to college out of which a little more than half graduated with a degree"
As of 2010, there are 380 (vs 327 Indians) out of every 1000 Pakistanis age 15 and above who have never had any formal schooling. Of the remaining 620 (vs 673 Indians) who enrolled in school, 22 (vs 20 Indians) dropped out before finishing primary school, and the remaining 598 (vs 653 Indians) completed it. There are 401 (vs 465 Indians) out of every 1000 Pakistanis who made it to secondary school. 290 (vs 69 Indians) completed secondary school while 111 (vs. 394 Indians) dropped out. Only 55 (vs 58 Indians) made it to college out of which 39 (vs 31 Indians) graduated with a degree. While Vij's explanation of Barro-Lee data-set sounds quite plausible, I still stand by my conclusion made in the earlier post that the percentage of population that completed secondary and tertiary education in Pakistan is higher than that in India. Another important point to note in Barro-Lee dataset is that Pakistan has been increasing enrollment of students in schools at a faster rate since 1990 than India. In 1990, there were 66.2% of Pakistanis vs 51.6% of Indians who had no schooling. In 2000, there were 60.2% Pakistanis vs 43% Indians with no schooling. In 2010, Pakistan reduced it to 38% vs India's 32.7%. Clearly, both India and Pakistan have made significant progress on the education front in the last few decades. However, the Barro-Lee dataset confirms that the two South Asian nations still have a long way to go to catch up with the rapidly developing nations of East Asia as well as the industrialized world. Keep up the great service to the community - you are educating us. Lets forget India comparisons and focus on the pathetic state of Pakistan's education. We need a US sponsored (both government and private ) initiative to channel most of the aid dollars to education. Oostur: "We need a US sponsored (both government and private ) initiative to channel most of the aid dollars to education." About a billion dollars of British aid for Pakistani prim & sec schools and hundreds of millions of US dollars from US AID are flowing into higher education in Pakistan. However, not only are the aid donors fickle, the foreign aid can not be really effective unless Pakistanis get their house in order. For example, a government education task force last year said that "under 1.5% of GDP [is] going to public schools that are on the front line of Pakistan's education emergency, or less than the subsidy for PIA, Pakistan Steel, and Pepco." Just getting rid of such subsidies by privatizing state-owned money-losing corporations and giving the money to education can help fund public education better. So, I agree. We need to have more dollars flowing to eucation. I have Stopped dreaming about Pak government to do better. Given the massive Transformation the Education sector has to go through, it would be prudent to outline the small steps required to achieving literacy rate gain of 5-7% per annum. The goal is to achieve 100% literacy in 15 years. The literacy rate can be sub divided into primary, secondary and higher education categories - funds should be allocated based on the priorities. Imran: "Given the massive Transformation the Education sector has to go through, it would be prudent to outline the small steps required to achieving literacy rate gain of 5-7% per annum...."
First, we need to differentiate mass literacy from formal schooling and then try to understand specific areas where the problems are the most pressing. In terms of mass literacy campaign, I think the initial target needs to be rural females, particularly in FATA, KP & Balochistan, who suffer the highest rates of illiteracy. This is likely to offer the biggest payoff because women can influence children the most and help the entire family. A possible initial focus for the Si valley crowd might be to support & enhance the ongoing UNESCO literacy campaign using cell phones. A pilot program in Pakistan has demonstrated the effectiveness of pushing mass literacy through the use of cell phone text messaging capability. The five-month experiment, initiated by United Nations Educational, Scientific and Cultural Organization (UNESCO), targeted 250 females aged 15 to 24 years old in three districts of Pakistan's Punjab province. In this pilot project which successfully concluded last month, the participant who have just completed the basic literacy course, were given a mobile phone each. They received three text messages a day in the local language. They were required to practice reading and writing the messages in their work book and reply to their teachers by text. Other ICT initiatives and informal education methods used by UNESCO in villages should also be considered here. These methods focus on teaching to read & write words and sentences used in agriculture & other rural occupations in village life which are familiar to the rural folks. Such exercises are sometimes done by writing in the dirt without the use of pencil and paper. The most important here is the teacher or facilitator familiar with such techniques. For formal schooling, it's the rural children who need the most help. Here, we need to work with local reps of organizations like DIL, HDF & TCF to understand how we can contribute. Investments in higher education seem to have reaped dividends as six universities of Pakistan, including the University of Karachi (KU), have won a place among the top 300 Asian universities. The QS Asian University Rankings 2012 list shows National University of Science and Technology (#108), KU (#191-200), Aga Khan University (#201-250), Lahore University of Management Sciences (#251-300) and The University of Lahore (#251-300) in the top 300 universities of the continent. Quacquarelli Symonds (QS) is the world’s most renowned and prestigious ranking agency. A statement issued on Wednesday by the Higher Education Commission (HEC) claimed that the rankings speak volumes about the hard work put in by the management and faculty of these universities. The HEC has consistently supported the varsities in terms of infrastructure, digital libraries, opportunities for innovative research, collaborative research projects with leading international institutions and participating in international exchange programmes, it was said. Pakistani universities have produced more PhDs in the past nine years (3,280) – since the establishment of the HEC – than in the first 55 years (3,000) of the country’s establishment. Research output has grown eight-fold since 2002 (from 815 in 2002 to 6,200 in 2011) which is a remarkable achievement by any world standard. Eighty per cent of these research publications are coming from higher education institutes. The output has more than doubled in the last three years and is expected to double again in the next three. Around 5,000 scholars from Pakistan have presented their research work at leading conferences of the world and have established academic linkages with their counterparts in every leading university of the world in the US, UK, China, Germany, France, Australia, Korea, etc. According to the HEC, Pakistani scientists, engineers and technologists are the country’s biggest strategic asset. Till five years ago, they were concentrated in a few strategic organisations, but the higher education revolution brought about by the HEC has ensured that every engineering and science and technology university has started to blossom into a centre of research and innovation. The HEC declared that it has been able to break the elitist myth of availability of talent only in large cities by providing scholarships to talented students belonging to the middle class and poor segments of the society. Currently, the education commission is focusing on expansion of facilities for biotechnology and genetics, immunology, robotics and automation, nanotechnology, superconductivity, photo-optics and lasers, electromagnetics and nuclear fusion for energy, it was stated. Pakistan's economy grew by 3.7 percent in the current fiscal year with tax collection up an "unprecedented" 25 percent, Finance Minister Abdul Hafeez Shaikh said Thursday. He unveiled the statistics one day before presenting the next budget to parliament amid concerns that Pakistan is headed towards a financial crisis unless it returns to the IMF. "The growth rate remained 3.7 percent and it is the highest in the past three years," Shaikh told a news conference of the current fiscal year that ends June 30. "The growth rate for a country like Pakistan should be at least five to six percent and this is our medium term goal," he said. Shaikh said that high oil prices in the international market had affected economies all over the world, including Pakistan's, and that Taliban and Al-Qaeda-linked violence deterred foreign investors. Pakistan has also suffered from a second consecutive year of major flooding, totting up losses of $3 billion, Shaikh said. The minister said the budget deficit was five percent for the period July 2011 to April 2012. External forecasts predict it will nudge closer to seven percent of GDP for the fiscal year amid warnings that the government is running out of ways to fund it. The IMF bailed out Pakistan with an $11.3 billion loan package in 2008 that stopped last November after Islamabad rejected strict reform demands, largely over tax. Shaikh said tax collection had increased by 25 percent compared to the previous year. "For the first 10 months we had tax collection of 1,450 billion rupees as compared to 1,050 billion rupees last year and it is an increase of 25 percent which is unprecedented in Pakistan's history," Shaikh said. The country's tax revenues are among the lowest in the world at just 9.8 percent of GDP in fiscal 2010-2011, says the Asian Development Bank. Less than two percent of the population pays tax on their income. The minister said the government had reduced its expenses by 10 percent. Inflation stood at 10.8 percent, compared to 13.8 percent during the previous fiscal year, he said, adding: "We have adopted a tight monetary policy." Pakistan has also missed out on payments from the United States for its efforts to fight militancy under the Coalition Support Fund (CSF). This brought around $8.8 billion into Pakistan's coffers between 2002 and 2011, including $1.5 billion in 2009-10, but Islamabad stopped claiming the money as ties with Washington collapsed in the wake of the raid that killed Osama bin Laden last year. Apart from providing education, primary schools have an added incentive for children in upper Swat. They get free food rations for attending classes under the United Nations World Food Safety Net Feeding Programme. This has subsequently upped the enrolment rate in the schools by 60 per cent, it has been learnt. Students have been provided energy biscuits and cooking oil under the World Food Program-sponsored programme since 2009. Teachers said that the project is achieving more than their expectations. “Apart from increasing enrolment in primary schools, the programme aims to eliminate child labour and improve attendance,” Programme Manager Amjad Ali told The Express Tribune. He said that around 130,000 children and teachers in 610 primary schools of the upper Swat have benefited from the programme. Another schoolboy, also holding an oil canister he got from school, seemed even more jubilant than his classmates. “We are getting double advantage: study and food. We love our school,” they said in unison. “This is an effective way of attracting children towards schools,” said Kalam Education Department Centre In-charge Shah Nazar. “We don’t need to launch new campaigns to attract students; we are already short of space to accommodate them,” he said. Nazar added the programme has also motivated parents who were initially sceptical about sending their children to school and were more inclined towards sending them to work instead. Abdul Ghafar Khan, a teacher in Kalam, concurred. He said that with the incentive of food, even street children have been admitted to schools. What is the relevance of your comment here. it is heartening to see that in 1990 there were 66.2% of Pakistanis who had no schooling compared to 38% now. What is the point of comparing this with India. How does does this up yours or i am a percent point better than you attitude attitude in every aspect of life benefit Pakistan? Zia: "What is the point of comparing this with India. How does does this up yours or i am a percent point better than you attitude attitude in every aspect of life benefit Pakistan?" It's called benchmarking, and helps you understand how you are doing relative to your region....and Barro-Lee dataset is used for this purpose by the UN and its various agencies. It shows that in spite of faster progress, Pakistan is still 5% behind in getting children into schools, but Pakistan has done better than India in terms of the percentage of population completing high school and college education. BTW, would you rather compete in an arms race? "t shows that in spite of faster progress, Pakistan is still 5% behind in getting children into schools, but Pakistan has done better than India in terms of the percentage of population completing high school and college education. " And India has done far better in proving itself to be a worthy competitor to west in knowledge based economy. Pak is non existent. So much for completing education. Jayesh: "And India has done far better in proving itself to be a worthy competitor to west in knowledge based economy"
Worthy competitor to the west? Really? Or just cyber coolies to the West? India's IT sector business is essentially driven by low-cost call centers, first-line tech support, simple repetitive code writing, and execution of pre-defined test suites. A typical Indian IT worker is increasingly being called a "cyber coolie" or sometimes a "code coolie", the former term having been coined by an astute Indian columnist Praful Bidwai back in 2003. It takes high quality education to compete with the West, not the kind of low quality education Indians receive in India. Sniff Sniff. I smell something burning. So what is stopping Pak from doing the same. Surely it is no worse than making underwear and towels for west. Fact is, India producers far better educated folks who can do R&D jobs. Shall I post URL of your ex-employer Intel's India web site. I can also throw in Oracle, Cisco, Samsung's web site mentioning what their Indian R&D office does for them. Shall we believe them or Praful Bidwai. Interesting that when it is convenient you are willing to quote an indian over western companies. If you represent the best of educated Pakistani brain, then India has no worries for competition. Just admit it. Pak has no quality in education. Jayesh: "Surely it is no worse than making underwear and towels for west." Forget the hype. Deal with reality of India. Jayesh: "Shall I post URL of your ex-employer Intel's India web site." I am quite familiar with what Intel does in India and labels it "R&D". It's the kind of work that is done with well-established, well-tried & well-tested tools and technologies that requires following clear instructions with little thinking. No new ground is broken at these offshore "R&D" centers. Israel is the only exception to this rule. It's all about wage arbitrage and nothing else. It's essentially glorified coolie work. Jayesh: "Just admit it. Pak has no quality in education"
Rather than express a biased and groundless opinion lacking any data or factual basis, I have already shared with you PISA and TIMSS results confirming the absence of quality in Indian education. According to Nasscom, the official BPO& IT exports for fiscal 2011 stood at $69 billion. I'll take that any day Riaz. Envy, snobbery or plain hatred on your part but, ultimately, it is a huge figure for India which was non existent about 15 years ago. Pakistani intellectuals who don't understand the struggle of the common man in the subcontinent can comment from your imagined ivory towers and call it "cyber coolie" but it employs lot of people in India upwards of 2 million. Even then, the facts are 24% of that export figure is BPO or "back office", 56% is ITes or code writing and 20% and rising is software engineering, consultancy and applications. Companies such as Cognizant Technologies are in this area. Mr Haq, I understand that as a Pakistani it is hard for you to accept India's success in knowledge based economy. Well if you care to get informed, you will know that almost all top tech companies have huge r&d office in india producing top notch stuff. BANGALORE: The world's largest chipmaker, Intel, on Tuesday unveiled its latest microprocessor for servers, designed entirely by its Bangalore team and developed in a record two years. The Intel R&D centre in Bangalore designed the Xeon 7400 series processor and it marked the first time that work on the 45 nanometre technology was taken up by the company outside its US home base. The six-core microprocessor is based on Intel's x86 architecture. Coolie work ???? Doesn't seem so. Actually IT is stealing the thunders of some of the other industries. One such is Pharma. Indian pharma companies now have a reputation to reverse engineer any drug and come up with a cheap drug. Many African and Asian countries now depend on indian drugs. Even in US , Walmart supplied generic drugs are siginifantly procured from India. Honestly Pak can learn a lot from India in producing educated force which can do this. As of now, they don't seem capable of doing anything remotely close. Do you think there is no reason why a single Pak company is well known. As a Pakistani I grudgingly admit that I have seen many TV talk shows or read books or articles written and hosted by Americans where they have praised Indians. This is reflected by their huge collaboration in various industries. It is matter of regret that Pakistan is completely absent. I find it hard to believe that Pakistan's education level is same as India. If it indeed is, then shame on our educated and business community to not replicate India's success. If it is not, then to some extent that explains why can't do what India did. Jayesh: "The Intel R&D centre in Bangalore designed the Xeon 7400 series processor and it marked the first time that work on the 45 nanometre technology was taken up by the company outside its US home base. The six-core microprocessor is based on Intel's x86 architecture." I know x86 architecture well. I was part of the original design teams of 80386 and 80486 processors in the US. I also worked with the people who developed the semiconductor process technology for these processors. It's obvious that you do not understand what R&D in microprocessors really means. Transferring a well-established processor architecture to finer geometries is not original development...the real research & development work for such new process technologies is still done by TD groups in the US and Israel...what's left for other offshore groups is using the RTL and std cells already built, characterized and tested in the US. I do acknowledge that the team in India was capable enough to do what it was asked to do on xeon. I also know that many US-educated and US-trained engineers work as leads on these projects. Anon: "As a Pakistani I grudgingly admit that I have seen many TV talk shows or read books or articles written and hosted by Americans where they have praised Indians." ..I..saw much in this recent visit that did not conform to the main Western narrative for South Asia -- one in which India is steadily rising and Pakistan rapidly collapsing. This is the Indian govt version.It leaves out the most important facts of Indian space program history. APJ Abul Kalam is credited with designing India's first satellite launcher SLV3. Its design is virtually identical to the American Scout rocket used in the 1960s. According to the details published in the Bulletin of Atomic Scientists, Abul Kalam spent four months in training in the United States in 1963-1964. He visited NASA's Langley Research Center in Virginia, where the U.S. Scout rocket was conceived, and the Wallops Island Flight Center on the Virginia coast, where the Scout was being flown. Soon after Abul Kalam's visit, India requested and received detailed technical reports on the Scout's design, which was unclassified. US Scout and India's SLV3 are both 23 meters long, use four similar solid-fuel stages and "open loop" guidance, and lift a 40-kilogram payload into low earth orbit. The SLV's 30-foot first stage later became the first stage of the Agni. The United States was followed by others. Between 1963 and 1975, more than 350 U.S., French, Soviet, and British sounding rockets were launched from India's Thumba Range, which the United States helped design. Thumba's first group of Indian engineers had learned rocket launching and range operation in the United States. Riaz Haq: "Here are the names of 6 Pakistani universities among top 300 Asian universities ranked by QS 2012"
"Indian students rank near the bottom on PISA, a global test of learning standards conducted in 74 nations this year." Let's get a few things straight. In India, students from only 2 out of 28 states and 7 union territories were surveyed. Next, the PISA survey was not conducted in Pakistan (why they thought of Pakistan as irrelavamnt for the survey – is anybody’s guess). So, your well camouflaged exercise in one-upmanship lacks basis, due to lack of PISA findings on Pakistan and standards of education. Thirdly, speaking of quality of education. You have quoted the rankings of universities in Asia. There are a total of 6 universities from pak that feature on that list, with pak’s premiere NUST university featuring at 108. Meanwhile, 8 Indian universities are in the top 100. Clearly, even the best that pak has to offer, is just not good enough. Fourthly, for all your talk of Indians being cyber coolies and wage arbitrage, the fact is that the Indian services sector has bloomed into a multi-billion dollar industry that any lesser developed nation would long for. Finally, your aggressive and confident posturing against india suggests a sense of accomplishment, and achievement. And that would be acceptable from even citizens of countries like Sri Lanka. But Pakistan?!?!? Really?! Last I heard, pak was readying for a fresh round of begging at the IMF. Ashmit: "In India, students from only 2 out of 28 states and 7 union territories were surveyed." Students from two states each from different parts of India took PISA and TIMSS...that's four states all together. Himachal Pradesh (North) and Tamil Nadu (South)took PISA & Orissa (East) and Rajasthan (West) took TIMSS. 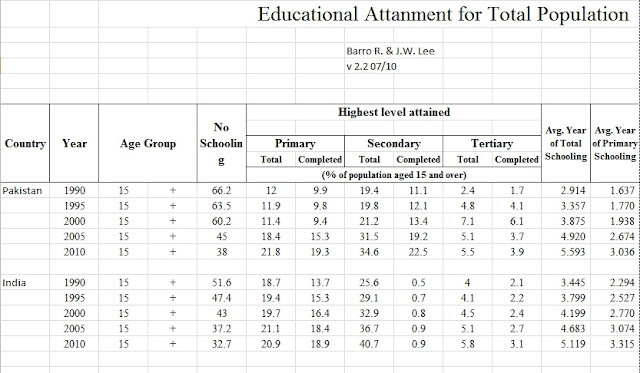 All of the four sates' students averages were at or near the bottom. If students from the largest, poorest and most backward Indian states of Bihar, MP & UP in the Hindi heartland had participated, the results would be no better. Ashmit: "due to lack of PISA findings on Pakistan and standards of education." Indian students ranked bottom, and Pakistanis would do no worse...it's hard to go below the bottom. Ashmit: "here are a total of 6 universities from pak that feature on that list, with pak’s premiere NUST university featuring at 108. Meanwhile, 8 Indian universities are in the top 100. Clearly, even the best that pak has to offer, is just not good enough". You are bragging about 8 out of 504 universities in India with 1.2 billion people vs 6 from 143 universities in Pakistan with less than 200 million population? You missed the point that 8 are in top 100 as opposed to none for Pakistan in top 100. Population ratio comparison that you seek to do is only valid if you take into account the total students at these universities. Singh: "My count is 26"
Shouldn't it be closer to 40 compared to Pakistan's 6 to account for the population ratio? For a population ratio comparison one must take into account the student body. For example, U of Calcutta ( my alma mater) has an undergraduate student body of more than 100,000. Exactly the size of students in India vs Pakistan in top institutes ie top 500 is 15:1. Also Indian Universities in the top 500 are ranked much higher with some of the top 100 rankings having very large student bodies like Delhi University. Though still I don't consider Indian universities outside IISc(ranked World #60 in Chemistry and in top 100 in Physics and Life Sciences) and IIT(all in world 500 ranking) and a few others being all that good. CHITRAL, Pakistan — During a grand gathering of tribal elders in this rugged and remote mountain district recently, one guest of honor stood out: an elderly Englishman in a suit and polished shoes, his snowy hair carefully combed, the morning newspaper folded on his lap. That man, Geoffrey D. Langlands, has had a front-row seat on Pakistan’s many dramas since he arrived, at the country’s chaotic birth, 65 years ago. He has taken tea with princesses, dined with dictators, been kidnapped by tribesmen and scraped through several wars. Now, at 94, Mr. Langlands, a former British colonial officer who retired with the rank of major, and a lifelong educator, is striking out on a fresh adventure: retirement. For the past quarter-century, his home and work have been in Chitral, a sweeping district of snow-dusted peaks at the northern tip of Pakistan. The institution he founded and ran here, the Langlands School and College, has become a watchword for excellence; each year, the best of the school’s 1,000-plus students, one-third of them girls, go on to universities in bigger cities, the United States or the United Kingdom. That success is all the more startling for its setting in a region awash with violence and intrigue: to the east of Chitral is the Swat Valley, where Pakistan’s army fought Taliban insurgents in 2009; to the west lies the Afghan province of Nuristan, where American troops have seen some of their toughest combat. Some years ago mysterious Americans turned up in town asking questions about Osama bin Laden; locals said they worked for the Central Intelligence Agency. But replace him they must. A minor stroke a few years ago left his hands trembling; doctors worry about the effects of another freezing winter in Chitral. A current of worry courses through local conversations: when the major goes, will his proud school survive him? “They have so much respect for Major Langlands that I think they wanted to clone him,” she said by phone from London. Urgent work awaits. As Mr. Langlands has slowed in recent years, problems have piled up: unpaid school fees, lagging teacher wages, a lack of computers, organization and money. Already, Ms. Schofield has raised $55,000 to improve the bumpy track that curls up a steep slope to the senior school: last year a school bus with 14 students on board tumbled over the side; miraculously, no one was badly hurt. Mr. Langlands, meanwhile, will move to Lahore, where his former students have arranged a small apartment for him on the magnificent grounds of his old school, Aitchison College. He has also, quietly, chosen his spot in one of the city’s Christian cemeteries: near the gate, he says, so friends can visit. But first, he says, there is more work to be done: a memoir to write, a 95th birthday to share with his brother and more fund-raising. His dream, now, is to build a proper dormitory in Chitral, creating an ever better academy. I guess my Indian compatriots have to be more mature in responding to Riaz Haq's observation. It need not always be a Pakistan India duel. The fact is that the IT success story is as Riaz says no different than selling towels and hosiery.If that we not so, we would have seen Indian companies coming out with a lot of IT products; there are just a handful here.Large Indian IT giants shirk away from products and focus on services.As margins come crashing down, the emphasis turns to squeezing more from junior resources, but hardly towards high value added stuff.In the US and Israel, the opposite is true. Small companies show great innovation and promise in coming out with excellent products. I read an eye opener piece many years ago to a great article in an Indian newspaper.The author alluded to the times in mid nineteenth century when the English were laying out railwy lines in East Africa.Most of the labour was Indian, and the skills ranged from those of a poor labourer at the bottom to the Engine driver, who was at the pinnacle of technology knowhow.His relatives used to boast of his being an engine driver, and many gulible folks then used to claim that without the engine driver, the British empire would collapse.Indians were in larger number than the English, so the belief was that the English empire depended on Indians (this term applies to both Pakistanis and Indiansof today! )to run its economic engine. AG: "I guess my Indian compatriots have to be more mature in responding to Riaz Haq's observation. It need not always be a Pakistan India duel"
While India has made significant progress, it still remains essentially a poor, backward, third world nation comparable with sub-Saharan Africa on most indicators. 1. They quote Pervez Hoodbhoy to claim that Pakistanis export bedsheets & towels while Indians export IT products. The fact is that India exports a lot more textiles than Pakistan. Last year Indian textile exports were worth $34 billion (Source: Economic Times), more than twice Pakistan's $14 billion (Source: Dawn). India's IT exports consist mainly of low-end services, not high-end products. So the chances of finding an Indian made textile or an Indian taxi driver are twice those of finding a Pak made textile or Pak taxi driver. Finally, it's a fact that India has been and continues to be home to the world's largest population of poor, hungry and illiterate people who still defecate in the open. Pakistani universities are grappling with yet another financial crisis after parliament’s approval of a 2012–13 higher-education research budget of 15.8 billion rupees (US$166 million), 10 billion rupees less than the Higher Education Commission (HEC) had asked for. The HEC, which governs and distributes funds to Pakistan’s 74 government-funded universities, was set up in 2002, and it brought about revolutionary changes in the country’s higher-education system. University enrolment tripled between 2003 and 2008 and the number of international research publications from Pakistani institutions rocketed from 600 per year to more than 4,300. The HEC’s research funding rose from 270 million rupees in 2002 to 22.5 billion rupees in 2009, but fell to 14 billion rupees last year. The financial stress has already led to the closure of many research and higher-education projects, including a programme of ‘Core Groups’ to promote life sciences, chemistry and physics. Most of the 175 new projects funded by HEC last year are going at a slow pace or have been halted for want of funds. The main reason behind the low funding for the HEC is a constitutional amendment enacted in 2010 that devolved responsibility for several federal ministries, including the education ministry, to the provinces. The government has tried to devolve the HEC as well, even though it was not under the control of the education ministry. This led to mass protests in April 2011, and Pakistan’s Supreme Court declared the plan unlawful. Academics say that devolving the HEC to the provinces would undo the recent improvements in higher education, and some believe that the federal government considers the HEC a financial liability, as spending money on an institution that will eventually be devolved to the provinces is an unfruitful investment. The government issued a notification on 11 June bringing the HEC under the control of the Ministry of Professional and Technical Education, paving the way for devolution. This move was widely opposed by academics, who fear that it will damage the commission’s autonomy. Kaleem Ullah, president of the Federation of All Pakistan Universities Academic Staff Association (FAPUASA), which organised the 25 June protests, says that his group will not be satisfied until all withheld funds are released. FAPUASA has threatened to stage continuous protests until the funding issue is resolved. To get an understanding of the working of Higher Education Commission (HEC) and developments occurred in the last few years in the sector of higher education in Pakistan, an official delegation of representatives from Tajikistan and Kyrgyzstan visited HEC head office here in Islamabad. He said that research output has grown eight-folds since 2002 (from 815 in 2002 to 6,200 in 2011) whereas 80 per cent of these research publications from Pakistan are coming from higher education institutions (HEIs). Naqvi further mentioned that output has more than doubled just in the last three years and is expected to double again in the next 3 years. He claimed that Pakistan today is a regional leader in ICTs, which other countries are following. The digital library provides access to 75% of the world’s literature (23,000 e-journals and 45,000 e-books). He also informed that due to revolutionary reforms in the sector, Pakistani universities have been included among the top world and Asian universities and Pakistani higher education model is being followed by other Asian countries. He also highlighted the development strategy of HEC and various steps undertaken to improve quality of teaching and research, equitable access to higher education, university-industry and community linkages and human resource development in Pakistan. The delegation appreciated the role of HEC in brining vibrant and effective changes in the higher education sector of Pakistan and showed keen interest for collaboration with HEC and Pakistani higher education institutions. The delegation also visited Quaid-i-Azam University and National University of Science and Technology and attended the presentations about these two leading universities. The delegation was led by Sardarbekov, Deputy Governor of Naryn Oblast, Kyrgyzistan and Farkhod Rakhimov, First Deputy Minister Ministry of Education, Tajikistan. Shamsh Kassim Lakha, former federal minister of science and technology and Asadullah Sumbal, senior economist Asian Development Bank along with senior officials of the university of the Central Asia accompanied the delegation. Under the new UK Operational Plan for Pakistan (2011-2015), almost 1.4 billion pounds have been allocated for Pakistan, primarily in the education sector. According to sources, the plan will make Pakistan the largest recipient of the UK development assistance in the world. UK believes that Pakistan’s education system is in crisis, and the country has a booming youth population. By 2032, the number of young people in Pakistan will be larger than the entire UK population. That’s why education is one of the UK’s priorities in Pakistan from 2011 to 2015, besides peace and stability in conflict-hit areas of in the country. Between 2011 and 2015, the UK will support four million children in school and construct more than 20,000 classrooms. The UK is Pakistan’s second largest trading partner in Europe after Germany and an important source of foreign investment and remittances. Bilateral trade with the country was 1.77 billion pounds last year. Importantly, the two sides have agreed to a Trade and Investment Roadmap to not only increase the bilateral trade to 2.5 billion pounds by 2015 but also enhance investment opportunities. There are over 100 British companies in Pakistan. Pakistan’s relations with the UK have become stronger and more meaningful since signing of the Enhanced Strategic Dialogue (ESD) on April 5 last year. The UK has also been very supportive of Pakistan’s desire for inclusion in GSP+ in 2014. “With the initiatives taken by the HEC, Pakistan was poised to make a major breakthrough and evolve into a knowledge economy from an agricultural economy,” he said. He lamented that an official notification was issued on November 30, 2010 to fragment the HEC and break it into pieces. Rehman, however, being the Pakistan Academy of Science president intervened and approached the apex court to receive an order which declared the fragmentation of the HEC to be unconstitutional. “The government, however, slashed the commission’s budget by 50 per cent and a number of development programmes in universities have come to a halt,” he said. Making a reference to an article in The Hindustan Times, he said, “The rapid developments posed a threat to India, but we ourselves are our own worst enemy.” He added we had this aim that Pakistan should not equal India but outdo it in terms of research outpost. He also highlighted the fact that during his term as minister, he successfully convinced the former president, Pervez Musharraf, to increase the education budget by 2,400 per cent and that of science and technology by 1,600 per cent. According to Dr Rehman, around 11,000 scholarships were awarded to students to study abroad at mostly European universities. He said that the world’s largest Fulbright scholarship programme was initiated, with a research grant worth $100,000 dollars and a job arranged for the recipient a year prior of returning to Pakistan. The HEC also developed the Pakistan Education and Research Network (PERN) through which 60,000 textbooks and 25,000 research journals were made accessible to students at their educational institutions. The students’ enrolment at the universities climbed up to 850,000 from 270,000 in just nine years while the universities produced 3,685 PhDs in such a short span which earlier were 3,200 in total from 1947 till 2000. As for technological development, Dr Rehman said that fiber-optics lines which were laid in 40 cities in the year 2000, expanded to 400 cities allowing access to internet in nearly 1,000 cities and villages from just 29 cities previously. Pakistan has been increasing enrollment of students in schools at a faster rate since 1990 than India. In 1990, there were 66.2% of Pakistanis vs 51.6% of Indians who had no schooling. In 2000, there were 60.2% Pakistanis vs 43% Indians with no schooling. In 2010, Pakistan reduced it to 38% vs India's 32.7%. The number of private schools grew 10 fold from about 3000 in 1983 to over 30,000 in 2000. The rate of private school formation far exceeds the rate of population growth. Using numbers for primary school enrollment in 1983 from Jimenez (578,330 students in the four provinces of Pakistan) and our latest numbers we get an overall increase of 937%, far greater than the 57% population increase (in the same four provinces) between 1981 and 1998. Thus the growth in private school enrollment, even after controlling for population growth, is enormous. Then Musharraf years saw doubling of pubic education spending along with rapid growth in private funding. I think you should read this, current GDP spending on education in Pakistan is just 0.9% of GDP or 0.58% of total budget, do you really think Pakistan can get its nation out of illiteracy and quality education with such a low monetary allocation on education. Anon: "current GDP spending on education in Pakistan is just 0.9% of GDP or 0.58% of total budget"
Your figures do not make sense! How can 0.58% of budget be equal to 0.9% of GDP? Pakistan is expected to have second highest increase in research output ranking in the world, increasing from its current position of 43 to 27 in 2018. An encouraging news for higher education sector in Pakistan, the ranking is announced by the Scopus, world’s largest abstract, citation database of research literature and analytical tool similar to Web of Science (Impact Factor). The Scopus initiated a forecasting exercise on predicting in April 2011 under the topic, “How World Scientific Output will be in 2018”. According to the results of this mega exercise based on the research output from 2003-2010, Pakistan is expected to have the second highest increase in research output ranking in the world. Commenting on this development, HEC Executive Director Professor Dr. Sohail H. Naqvi said this ranking recognises the tremendous growth in research in higher education sector of Pakistan over the past ten years and it also predicts the a bright future for research in Pakistan.” The HEC has accomplished more in nine years since its establishment than was achieved in the first 55 years of Pakistan’s existence. Recently, six Pakistani universities have been ranked among the top 300 Asian universities. Research output has grown eight-folds since 2002 (from 815 in 2002 to 6,200 in 2011). Around 80 per cent of these research publications from Pakistan are coming from higher education institutions. Output has more than doubled just in the last 3 years and is expected to double again in the next 3 years. More than 5,000 Pakistani scholars have been facilitated to present their research work in leading conferences of the world. The HEC Video Conference Network is established in all public sector universities by covering 31 cities. The network is recognised one of the mega interactive network by having total 79 purpose built e-classroom based videoconference set-up. Access to 140 plus free software provided to over 1 million students in higher education sector and there has been more than 80,000 downloads from 68 universities during 2011-12. During 2011-12, a total of 447 accredited lectures/ lecture series have been conducted by both Local and Foreign Speakers under the Virtual Education Programme, totalling to 1,043 lectures since commencement of programme. The academic circles have termed the Scopus ranking as great success and honour for the county in particular and higher education sector in general. They believe that if the continuous support may be given to this sector and the faculty continues their work with same zeal and vigour, Pakistani higher education sector can win more laurels for the country. Four teams of talented Pakistani students represented Pakistan in the 23rd International Biology Olympiad (IBO) in Singapore, 44th International Chemistry Olympiad (IChO) in United States, 53rd International Mathematical Olympiad (IMO) in Argentina and 43rd International Physics Olympiad (IPhO) in Estonia. This year all the four teams showed excellent performance altogether winning One Silver, Four Bronze Medals and Two Honorable Mentions in these events. The International Science Olympiads are unique competitions organized to discover and encourage young talented students from all over the world, says a press release issued here by the Higher Education Commission of Pakistan Sunday. These young talented Pakistani students were facilitated under Science, Technology, Engineering and Mathematics (STEM) Careers Programme, a joint innovative venture of Higher Education Commission HEC and Pakistan Institute of Engineering and Applied Sciences PIEAS, for grooming talented students for careers in Science, Technology, Engineering and Mathematics (STEM). The main objective of this program is to inspire the Pakistani youth to opt for careers in science, mathematics and engineering and preparing them for participation in the annual International Olympiad in Physics, Chemistry, Biology and Mathematics. The program also encourages Pakistani students to come up with innovative solutions to problems of national interest. Pakistan has been participating in these international competitions since 2001. According to the details, The 23rd International Biology Olympiad (IBO) was hosted by Singapore from July 8 to July 15, 2012. About 236 students from 59 countries participated in the event. Of the three students who participated from Pakistan in the event, two won Bronze Medals and one got Honorable Mention The bronze medalists include Mr. Usama Tahir from Lahore Grammar School Lahore, Ms. Hafsa Shahab from Lahore Grammar School Islamabad, and Mr. Hassan Mirza (Honorable Mention) from Lahore Grammar School Lahore. The IBO team was led by Dr Zahid Mukhtar. The 43rd International Physics Olympiad (IPhO) was hosted by Estonia from July 15 to July 24, 2012. Total 400 students from 88 countries participated in the Olympiad. Of the five students who participated from Pakistan in the event, one of them won Bronze Medal. The awards winner is Mr. Muhammad Taimoor Iftikhar (Bronze Medal) from Rangers Public School & College Mandi Bahauddin. The IPhO team was led by Dr Shahid Qamar and Dr Aftab Rafiq of PIEAS, Islamabad. The 44th International Chemistry Olympiad (IChO) was hosted by United States, from July 21 to July 30, 2012. About 270 students from 70 countries participated in the event. Of the four students who participated from Pakistan in the event, one of them won Bronze Medal. The award winners is Mr. Armughan Ahmad Khan from Lahore Grammar School Lahore. The IChO team was led by Prof Dr. Khalid M Khan and Dr Muhammad Raza Shah of HEJ Research Institute, Karachi. Bajaur, one of the seven administrative units in Pakistan's federally administered tribal area (Fata), on the border with Afghanistan, has experienced a marked rise in school enrolment since the beginning of the year. "Enrolment has increased and this year we enrolled 39,000 new students," says Muhammad Gul, an education officer in Bajaur. "Yet 80,000 remain out of school." Gul believes poverty and illiteracy can be a potent combination in fuelling extremism. "If these kids don't have a pen in their hands, they will grow up and take up the Kalashnikov," he says. Part of the reason for the increased level of enrolment in the area is the return of families displaced by conflict in 2008-09. Around 250,000 people were still displaced from Bajaur at the end of 2009, according to the UN Office for the Co-ordination of Humanitarian Affairs. But for many the incentive is the ration of four litres of cooking oil (worth around £3, or just under $5) distributed every second month by the World Food Programme's (WFP) Back to School, Stay in School programme. To obtain the oil ration, students – who also receive locally manufactured high-energy biscuits daily from the WFP – must attend school 22 days each month. The scheme was launched in January 2011 in Fata and all four provinces of Pakistan, but funding problems mean it is now limited to government-run schools in Fata (excluding North Waziristan, where the WFP is not working due to conflict). WFP spokesman Amjad Jamal says the programme has a two-pronged strategy: to address short-term hunger and nutritional deficiencies, and increase enrolment and retain those already in school. The WFP has been engaged in school feeding in Pakistan since 1968. Gul says that, of Bajaur's 616 schools, 435 (of which 135 are girls' schools) receive WFP help, benefiting 60,000 children. "Some areas are difficult to reach still and thus left out from the loop," he admits. "We are seeking to make life easier for returnees by helping to ensure the provision of health and education," says Jamal. The NGO is supporting more than 990 schools, and 130,000 children take home the ration. The current programme ends in December, but will be renewed until 2015. According to the International Crisis Group (pdf), there were around 4,660 primary schools, including 2,000 girls' schools, in Fata at the end of 2008. However, literacy remains low, and more than half of children who enrol in primary schools drop out before completing class five due to "poor quality of instruction, corporal punishment, teacher absenteeism, inaccessible locations and poorly maintained facilities, including shortages of furniture, clean drinking water and lavatories". According to last year's national nutrition survey (pdf), 43.6% of Pakistani children under the age of five are stunted, 15.1% wasted, and 31.5% underweight. Approximately 32% are suffering from severe malnutrition, and 62.5% are anaemic. Data collected by the directorate of education in Fata shows that, as of the end of March, 417 schools – including 133 for girls – had been blown up. Militants are still targeting educational institutions in the region, which is why parents are fearful of sending their children to school. However, Gul insists "poverty is a much bigger issue". "Investing in the longer-term opportunities provided by education is not a consideration," Jamal says. And in tribal areas in particular, female education is seen as a wasted investment both economically and culturally. South Korea started off as a dirt-poor country just like India in 1950. Today, South Korea is considered a fully-developed country and a member of the OECD. Can you name any South-Korean innovation? When you cannot compete on price, necessity becomes the mother of invention, and so you innovate. Your example: US, Israel. When you can compete on price, you do that and let the others innovate & then learn from that innovation. This is exactly how the South-Koreans climbed the ladder to developed status. As far as South-Korea today is concerned, the latest innovations will happen in the richer US and they will then learn from the US to rise along with them. Actually, this view is not totally incorrect. The British Empire could not have been run without the collaboration and co-operation of Indians. This was true of the Empire in India as well as in Sub-saharan Africa, SE Asia and the Middle East & North Africa. Without Indian troops fighting & stabilizing swaths of SE Asia, North Africa and West Asia and Iran, the Empire would have lost both World Wars even before the US could intervene. Without India and Indians, the British Empire would have collapsed economically, politically and militarily a long, long time ago. This is exactly what Churchill said when he opposed granting India independence as he warned that losing India would spell the end of the Empire. And that is exactly what happened. The Empire effectively ended when India broke away. And BTW, the term "India" here refers to Unified India pre-1947. Very, very far away from "a fifth", methinks. Perhaps the World Bank Report cited is an old one? IMF is now projecting that India's Exports of Goods & Services will reach 1.4 Trillion$ by 2020. Our Exports of Goods & Services are projected to reach only 60 Billion$ over the same period. If Pakistan has indeed surpassed on most of the parameters, why don't you raise the bar and look for another benchmark? adaptability and resilience, entrepreneurship and shared coping. These forces can be found in the very new – widespread mobile banking services – and the very old – Islam’s traditions of charity, justice and learning. When government and donors work creatively with these forces, amazing things can happen. Pakistan has one of the best regulatory environments in the world for microfinance and one of the fastest-growing microfinance sectors, with 3m borrowers. It is also one of the most innovative places in the world for mobile banking services, partly due to the State Bank of Pakistan’s moves to encourage the market. About 1.5m customers make about 30m transactions a quarter through their mobiles, using a network of 20,000 agents, mainly local shops, to collect their cash. A wave of charitable giving by individuals has helped to ensure that the hundreds of thousands of people displaced by floods in 2010 are not still living in tents. A guerrilla army of more than 100,000 Lady Health Workers, funded by government, has helped to reduce markedly the number of women and babies who die in child birth, according to studies by the World Bank. 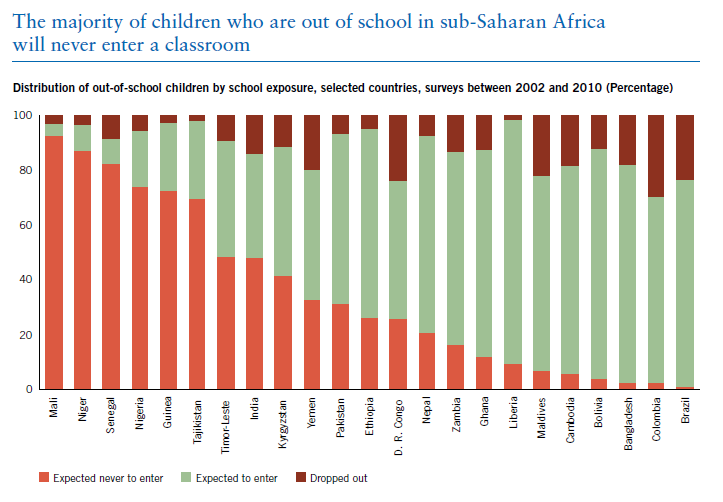 Too many children are still out of school and many government schools are woeful. Yet Pakistani parents go to enormous lengths to give their children, girls and boys, a chance at an education. Low-cost private sector schools, charging perhaps $2 a week, are booming in slums and villages. Wherever girls receive a secondary level education, small private schools run in the homes of their owners start popping up, as they put their education to use to improve their standing in society. Even the government’s conservative figures suggest that a third of children in Pakistan and half in Karachi, many of them from poor households, attend such schools. Indeed, Pakistan has a record in picking up new approaches to learning. The Allama Iqbal university in Islamabad, the first open university outside the UK, is the second largest in the world with 1.8m students. Start-ups such as Tele Taleem, tucked away on a dusty industrial estate on the outskirts of Islamabad, are pioneering ways to take learning to schools in the remoter regions, through satellite links and cheap tablet computers. Donors are playing a vital role in promoting social innovation. The UK’s Department for International Development has pioneered a new road map for school improvement in Punjab, which Sir Michael Barber, the education reform expert, says is delivering one of the world’s fastest improvements in school performance. In Karachi, tens of thousands of poorer families will next year receive vouchers to send their children to low-cost private schools. In agriculture, social venture capitalists such as Indus Basin Holdings are leading efforts to link groups of small-scale rice farmers to multinational companies. Pakistan’s institutions may seem frozen, its elites worried that taking on the extremists will provoke even more violence in the run-up to next year’s elections. Yet, at the grassroots, Pakistan is in perpetual motion, with ceaseless creativity as people find affordable solutions to their basic needs. These largely hidden forces of resilience offer the best hope for the country’s future. In Pakistan, the state may be fragile but society is far stronger than many think. Saturday, November 24, 2012 - Islamabad—The Pakistani universities are now able to produce more PhDs in the next 3 years as compared to last 10 years. The total number of PhDs in Pakistan has reached the figure of 8,142. According to the available statistics, the number of PhDs has increased from 348 (1947 to 2002) to 679 in 2012 in agriculture and veterinary sciences, from 586 to 1,096 in biological sciences, from 14 to 123 in business education, from merely 21 to 262 in engineering and technology and from 709 to 1,071 in physical sciences, Technology Times Reported. In social sciences, the number increased to 887 from 108 during last ten years. The figures also indicate that during the last decade, special emphasis has been paid to the disciplines of agriculture and veterinary science, biological, physical and social sciences, business education, engineering and technology. “HEC has so far introduced various indigenous scholarship schemes to create a critical mass of highly qualified human resources in all fields of studies who conduct research on issues of importance to Pakistan. Islamabad: Authorities in Pakistan are planning to build a model village in honour of late Arfa Karim, an information technology genius who at nine years became the world’s youngest Microsoft Certified Professional. Arfa’s ancestral village in Punjab, Ramdewali Chak No 4, will be soon developed into a model village at a cost of Rs140 million (Dh52 million) the Associated Press of Pakistan reported. A monument will be built at her grave, and a library and a museum will also be established within the model village. “She deserves to be honoured by the entire nation forever,” the APP quoted a government spokesman as saying. The village will have a girls’ degree college, a technical training centre, a basic health unit, a playground, improved drainage scheme, paved streets, provision of portable water and agriculture equipment. Arfa died in January 2012, aged 16, after complications resulting from an epileptic stroke and cardiac arrest. She rose to international fame when she became the youngest Microsoft Certified Professional (MCP) at the age of nine in 2005. She was subsequently invited to visit the Microsoft headquarters in Redmond, Washington, by founder Bill Gates. She received the Fatimah Jinnah Gold Medal in the field of science and technology in 2005, and was also the recipient of the President’s Award for Pride of Performance. In 2006, she was invited by Microsoft to be a part of a conference in Barcelona. She was the only Pakistani among over 5,000 developers in that conference, the Daily Mail reported. KARACHI - The Government of Germany is launching a joint initiative with eight German firms to impart vocational training for mechanical professionals in Pakistan. To be formally started in spring this year, the Germany-Pakistan Training Initiative (GPATI) was supported by the German Ministry for Economic Development and Cooperation through Deutsche Gesellschaft fuer Internationale Zusammenarbeit (GIZ). GPATI was a joint initiative of the German Consulate General in Karachi and eight German companies based in the metropolis. On Monday, Robert Bosch GmbH of Germany donated some tool sets consisting of over 10 top of the line power tools for the vocational institutes in Pakistan through their local principals, Adamjee Trading Corporation, a part of the Adamjee Group. The German Consul General Dr Tilo Klinner and Adpower Group Executive Director Hisham Adamjee presented the first set of the tool kits to AmanTech, one of the two vocational training institutes participating in the GPATI. The donated sets included tools for woodworking, metalworking, stone working and concrete drilling and breaking. The tools would enable trainees at the selected vocational training institutes to work with quality tools and according to international standards and to promote the German quality concept regarding products in Pakistan. Moreover, it would also allow the trainees to learn new skills which would help them compete and work in the international market. Bosch, one of the largest portable power tools manufacturers in the world, had recently launched their power tools in the Pakistani market which have proved its worth in the local market. GPATI was founded on the renowned concept of Dual Training System that was implemented effectively throughout Germany and was also successfully applied internationally. The objective of this unique training initiative was to produce a workforce that was immediately productive and ready to take on the existing and emerging challenges of the industry. The participants of this programme would have a good balance of knowledge, skills and a positive work attitude. On the Job Training (OJT) was an essential element of this concept. The two vocational training institutes participating in this programme were AmanTech and iACT. It takes at least 500 scientists and 1300 engineers with relevant training and skills to have a nuclear weapons program, according to a 1968 UN study...."a United Nations study conservatively estimates that at least 500 scientists and 1300 engineers are needed to develop and maintain warhead production facilities, and an additional 19,000 personnel (more than 5000 of them scientists and engineers) are required to produce delivery vehicles of the intermediate ballistic missile variety"
There's a recent book titled "Eating Grass: The Making of the Pakistani Bomb" by Feroz Khan to understand the basic fact that Pak nuclear weapons program has been a great catalyst for building national human capital and industrial base in the country. Since 1990s, Pak has built two indigenous nuclear reactors at Khushab entirely on its own. Two more are under construction now. As to nuclear power plants, Pakistan will find a way to generate more energy from various sources...the current PAEC plan is to build 8,800 MW nuclear power plants capacity by 2030. Indian commentators have pounced upon Feroz Khan's erudite work on "Eating Grass-The Making of the Pakistani Bomb" by citing what they claim is an error regarding Indira Gandhi's triumphant speech to Indian parliament after the fall of Dacca in 1971. ISLAMABAD: Robotics as a discipline of science and technology is being taught at the graduate and post-graduate levels by more than 60 universities of Engineering Science and Technology in Pakistan, official sources told Daily Times here on Saturday. The research and development (R&D) in advanced fields of Robotics and Artificial Intelligence has also been undertaken by some of laboratories established in the R&D institutes and universities in Pakistan. The official in the Ministry of Science and Technology claimed that there is a technical group engaged in development of automation of industrial processes at the National Institute of Electronics (NIE), Islamabad. The group has developed Programmable Logic Controllers (PLCs), which are used in automatic industrial controls. The Centre for Intelligent Machines and Robotics (IMR) at the COMSATS Institute of Information Technology has a Research Group, which is undertaking research related to robotics, computer vision and machine learning. The IMR Research Group is conducting basic and applied research in robotics technologies relevant to industrial and societal tasks; the robotics technology in Pakistan has the potential role in boosting the productivity and competitiveness. The researchers at CIIT are working for projects on visual guided robotic systems for use in surgery, navigation control, mapping and geometric representation of environmental parameters. National Engineering Robotics Contest (NERC) is an inter universities robotics competition held annually since 2005 at the NUST. The contest is organised by HEC, the Science, Technology, Engineering and Mathematics (STEM) Careers Project with more than 60 Pakistani universities participating in the event, and aims to train individuals for engineering services in Pakistan, and cash prizes are awarded to the winners. NERC 2011 held at the College of Electrical and Mechanical Engineering (EME), Rawalpindi from June 28 to July 2. Many universities like FAST, GIKI, LUMS, CASE and UET Lahore participated in the event, where students were encouraged to design, develop and programme their respective robots. R&D projects on Tele-Surgical Training Robot and Simulators and Development of Intelligent Robotic Wheelchairs are being undertaken by NUST funded by ICT R&D Fund. International workshops and seminars for knowledge sharing and events at national level for talent hunt among youth in the fields of robotics have been organised regularly at NUST. Specialisation in robotics is a popular choice for students going abroad to study under various scholarships schemes for research and PhD. This field offers job opportunities, and robotics engineers can apply their mastery in diverse fields like modern warfare, surgery, nano-technology and space-exploration. The official claimed that developing a robot comes with the goal of finding a solution to the problem. Along with the technical know-how, interest in research is essential. This field has promising opportunities, with no boundaries and will continue to grow with the advancement of science and technology in the near future. Rawalpindi:The 1st International two days Conference on Robotics and Artificial Intelligence was organized at NUST, College of Electrical and Mechanical Engineering.The conference held under flagship of IEEE and National University of Sciences and Technology (NUST) on Monday. ICRAI is the first of its series, and this conference will be held biennially. This conference covers latest and emerging trends in the fields of robotics and artificial intelligence including Intelligent Mechatronics and Robotics, Haptics, Tele and Medical robotics, Unmanned Vehicles, Prosthetics, Micro and Nano robotics, Artificial Intelligence, Neuro and Fuzzy control, Human Machine Interface and Automation. Maj Gen. Obaid Bin Zakria, commandant college of E&ME welcomed all participants and guests at the opening ceremony. He highlighted the importance of research conferences around the world and said that this is how knowledge integrates into development of great ideas. He appreciated the efforts put in by the Department of Mechatronics Engineering for arranging such an event. He said that NUST College of E&ME has been a home to novel, state of the art projects and the research work being done here is no less than the work done internationally. Our students are technically sound, very talented and extremely competent and the work presented in this conference is a proof of that. Dr. Mahmood Anwar Khan, the Conference Chair informed that more than 110 research papers had been submitted to the conference and after a thorough review, 20 were accepted for oral presentation and 13 for poster. He also mentioned that the conference was graced by four International key note speakers from USA, UK and Korea. Dr. Francisco Sepulveda from University of Essex, UK gave an interesting keynote talk on Brain Computer Interface Systems . At the end of his talk, he praised the level of research being done in Pakistan. Dr. Lynn E Parker from University of Tennessee, USA said in her recorded message that The conduct of such an event in Pakistan shows the research maturity of the academic institutions . She further assured to attend the conference next time. Dr. Younus Javed, Dean NUST College of E&ME emphasized that such events and meetings give a chance to form collaborative projects and research groups. Dr. Javaid Iqbal, Head of Mechatronics Engineering Department appreciated the turnout at the conference and said that the aim of conference is to have collaboration of national and international researchers from a wide range of academic and professional backgrounds to bridge the gap. At the end of the ceremony, the Chief Guest Dr. Javaid R. Laghari, chairman Higher Education Commission (HEC) gave souvenirs to the foreign keynote speakers. In his address, the Chief Guest congratulated NUST College of E&ME for arranging 1st International Conference on Robotics and Artificial Intelligence in Pakistan. He mentioned that conferences like this are not only a platform for great minds to meet but also a venue for research collaboration. He said that everyone should make the most of this opportunity and socialize and discuss latest topics of research. He also mentioned that this conference was the first of its kind and expected it to grow over the years into one of the prestigious conferences in the field of Robotics and Artificial Intelligence . A large number of participants from many Universities, colleges and research organizations of the country have benefited from this well focused and target oriented conference. The country’s first ever nanochemistry laboratory is slated to open at Karachi University next year. A ceremony to mark the beginning of the construction of the facility, called Latif Ebrahim Jamal Research Institute of Nanotechnology, was held at the institution on Monday. The first-of-its-kind research centre in the country will be a part of the university’s International Centre for Chemical and Biological Sciences (ICCBS) and receive Rs50 million worth of funds from the Husein Ebrahim Jamal Foundation. The director of ICCBS, Prof. Muhammad Iqbal Choudhary, said that the new centre will be housed in a two-storey building with ten large laboratories, a central instrument room, dedicated library, a central workshop, a pilot plant and faculty, seminar and meetings rooms. Speaking at the occasion, the founder of the Higher Education Commission, Dr Attaur Rahman, said, “In today’s world, nanotechnology has a major influence on the development of science and technology as well as engineering. The world of nanotechnology involves shrinking things down to a whole new level, where things are a billion times smaller than the world of metres that we live in.” He added that the country’s progress in the field of nanotechnology is strategically important for rapid industrial development. Dr Rahman added that in the near future, many fields, including manufacturing of new diagnostics, medicines, agrochemicals, defence products and engineering equipment will become dependent on nanochemistry. The HEJ Foundation had also played a key-role in the establishment of world-famous HEJ Research Institute of Chemistry at the university, which garnered tremendous recognition for Pakistan in the fields of chemical and biological sciences, said its chairperson, Aziz Latif Jamal. The foundation had also established the largest digital library in the region, named as LEJ National Science Information Centre. It has access to over 31,000 science journals and around 60,000 books from 220 international publishers. Sindh governor’s adviser on higher education, Aftab Lodhi, was also present at the event. Last year, 33.5 percent of Americans ages 25 to 29 had at least a bachelor’s degree, compared with 24.7 percent in 1995, according to the National Center for Education Statistics. In 1975, the share was 21.9 percent. The number of two-year college degrees, master’s degrees and doctorates has also risen recently. 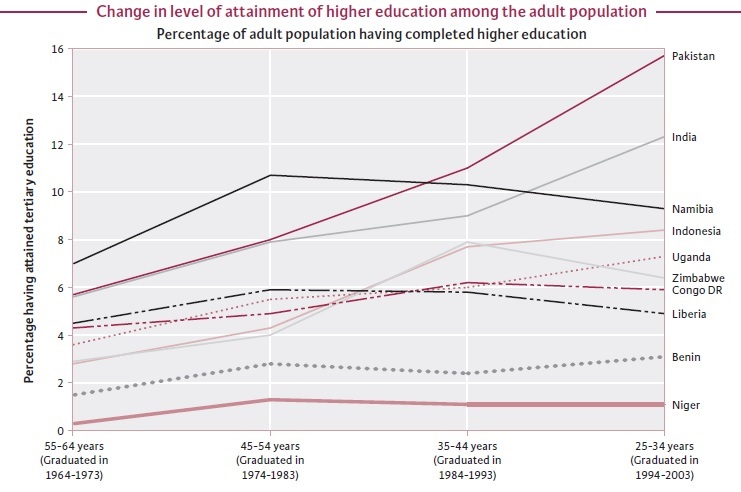 The increases appear to be driven both by a sharp rise in college enrollment and by an improvement among colleges in graduating students. The trends could bring good news in future years, economists say, as more Americans become qualified for higher-paying jobs as the economy recovers. College attendance has increased in the past decade partly because of the new types of jobs that have been created in the digital age, which have increased the wage gap between degree holders and everyone else. The recent recession, which pushed more workers of all ages to take shelter on college campuses while the job market was poor, has also played a role. The unemployment rate for graduates of four-year colleges between the ages of 25 and 34 was 3.3 percent in March, according to the Bureau of Labor Statistics. For high school graduates in the same age group who had not attended college, it was 11.8 percent. Today’s premium for college degrees is caused partly by increasing selectiveness among employers about whom they hire and screening based on education even for positions that do not require higher skills. But jobs themselves have changed, too. “Think about jobs 15 years ago that didn’t need any college education,” said Sandy Baum, a senior fellow at the George Washington University Graduate School of Education. Many of them now do, she added. Pakistan has witnessed, an impressive 50 per cent increase in the number of research publications during just the last two years, going up from 3939 to 6200 in the higher education sector of Pakistan. This has been the second highest increase worldwide. Scimago, the world's leading research database, forecast that if this research trend from Pakistan continues, then by 2018, Pakistan will move ahead 26 notches in world ranking, from 43 to 27, and for the first time ever, will cross Hong Kong, Singapore and Thailand in Asia. Today Pakistan is publishing more research papers per capita than India. The number of PhD faculty at our public universities has also increased by almost 50%, from 4203 to 6067 in just the last 2 years alone. 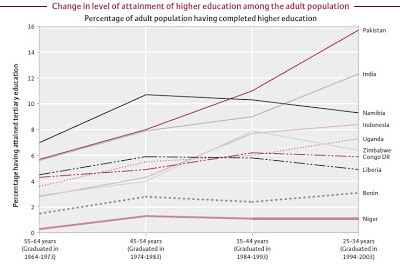 This is the result of the HEC PhD scholars that have started returning back and joining universities. These scholars are being selected for pursuing studies at leading universities of the academically advanced countries through a well-defined open, transparent and merit based mechanism. About 10 to 15 scholars are completing their PhDs every week and are being placed by HEC at the universities under Interim Placement of Fresh PhDs Programme (IPFP). Other HEC incentives include a 0.5 million research grant to every returning scholar. Currently, there are hundreds of fresh foreign PhDs currently inducted into various universities across the country. The number of PhD students enrolled at the universities has increased by over 40% in just the last one year, from 6937 to 9858 students, while over 28122 students are registered for MPhil/MS, up from 16960, an increase of 65% in just two years. The increase in the number of PhDs awarded is again very similar, from 628 to 927 in the last 3 years, and will surge exponentially in the future as more PhD faculty and students join the universities. Commenting on these developments, Dr. Javaid R. Laghari Chairperson HEC said that Universities are the single most important producers of knowledge and research that leads to innovation and entrepreneurship. By introducing innovation, creativity and interdisciplinary research as a vital component of teaching, and with knowledge exchange programs, the university contributes more directly to the economy and the society than many other institutions in the country. Pakistan is seeing a surge in private schools, a trend some find hopeful in a country where the government education system is decrepit and the other alternative is religious schools, known here as madrasas, which offer little education beyond memorizing the Quran and are seen as one source of Islamic militancy. The U.S., for one, says it plans to invest in private schools as part of a multibillion-dollar aid package designed to erode extremism in the nuclear-armed country battered by Taliban attacks. "The quality of education in the public sector is deteriorating day by day," said T.M. Qureshi, a Ministry of Education official. "When there's a vacuum of quality, someone will fill it." According to UNESCO figures, Pakistan spends 2.9 percent of its gross domestic product on education, slightly less than India's 3.2 percent and well below the U.S.'s 5.2 percent. One reason education has historically been a low priority for Pakistani governments, experts say, is that the governing elite can afford to send their children to the best private schools or to academies abroad. Another, the experts say, is the feudal structures in the rural areas that give landowners an incentive to keep farm workers uneducated and submissive. Only around half of Pakistani adults can read, schools often lack basic amenities like water, teachers get away with absences, and the bureaucracy is cumbersome. But since the mid-1990s, small, inexpensive private schools, once an urban phenomenon, have been sprouting in earnest in the poorer countryside, offering relatively affordable tuition, according to a 2008 World Bank report. Between 2000 and 2005, their number grew from 32,000 to 47,000, the report said. More recent Pakistani government statistics put the figure at more than 58,000. Around one-third of Pakistan's 33 million students attend a range of private schools, far more than the 1.6 million in the 12,000 madrasas. The private schools tend to outperform their government peers academically, though generally speaking, standards are low across the board, said Tahir Andrabi, an economics professor at Pomona College in California who has studied the trend. In the big picture, proponents of private schools echo the argument for charter schools in the U.S. — that they can make schools better and children more educated, and in Pakistan's case dent poverty and the appeal of extremism. The Higher Education Commission (HEC) has produced 8,161 PhD scholars up till 2012. As many as 10 to 15 scholars are currently completing their degrees each week, HEC Media Project Manager Murtaza Noor said on Tuesday. As many as 1,039 scholars have completed PhDs in agriculture and veterinary sciences, 1,211 in arts and humanities, 1,692 in biology and medical science, he said. As many as 1,978 scholars have been awarded PhDs in social sciences, 1,810 in physical science, 288 in engineering and technology and 143 in business education. “Pakistan is publishing more research papers per capita than India,” he said. The scholars completing their PhDs are placed in different universities under the Interim Placement of Fresh PhDs Programme (IPFP), said Noor. The HEC provides several incentives to these scholars, including a Rs0.5 million research grant to each returning scholar, he said. “Scholars are also being sent abroad to pursue studies in leading universities,” said Noor. The number of PhD students enrolled in universities has increased by over 40 per cent [from 6,937 to 9,858 students] in the past year. More than 28,122 students are registered for the MPhil/MS. The number of MPhil/MS students has increased by 65 per cent [from 16,960 to 28,122] over the past two years, he said. The number of PhDs awarded has increased from 628 to 927 in the last three years. The number is expected to surge exponentially in the future as more PhD faculty and students join universities, Murtaza said. Published in The Express Tribune, July 17th, 2013. The second meeting of the Scholarship Management Committee, held at the HEC Secretariat on Wednesday, approved the cases of 300 shortlisted students from 11 institutions for Pakistan-US merit and needs based scholarships. Chairing the meeting, Executive Director HEC Dr. Mansoor Akbar Kundi appreciated the collaborative efforts made by USAID for the education sector of Pakistan. He appreciated how USAID has supported HEC’s efforts to establish high-class educational centres, to build university-industry-government linkages, and internationally ranked universities, with trained faculties for increased research capacity. Adviser Research and Development (HEC) Dr. Tariq Mahmood informed the members that the merit and needs based scholarship programme was started in 2004 in collaboration between HEC and USAID, which till date has provided 1,807 scholarships to talented and needy students. “Of these, 1400 students have completed their education and are working at local and multinational companies. In the first scholarship management committee of phase-II, 221 scholarships were awarded to meritorious students,” he said. USAID Director Thomas Le Blanc told the members that the US government is committed to taking necessary steps to ensure that the country comes out of the challenges it faces. “Under the second phase, the programme would provide financial assistance to approximately 3,000 needy youth in the next five years along with fully funded scholarships to the students of agriculture, medical, business, engineering in top universities of Pakistan. Fifty per cent of the scholarships are reserved for female students,” he said. Institutions have been prepared during the survey. Puducherry as compared to All India average of 25. Total graduates at universities (including affiliated and Private/External students) were 380,773, 360,807,448,988 and 493,993 during the years 2005-06, 2006-07, 2007-08 and 2008-09. At the time of its independence in 1947, the nascent nation of Pakistan had only one university, the University of Punjab. By 1997, the number of universities had risen to 35, of which 3 were federally administered and 22 were under the provincial governments, with a combined enrollment of 71,819 students. There were also 10 private universities. The universities are responsible for graduate (postgraduate) education leading to master's and doctoral degrees in a variety of fields. Most universities have their own faculty in the various departments but many use senior faculty from the colleges to participate in the teaching program at the master's level as well as for supervising students at the doctoral level. The trend is, however, to concentrate all postgraduate work in the university departments in order to maximize the benefits of teacher-student interaction on a daily basis. This has tended to limit the college faculty exclusively to undergraduate education, which serves as a disincentive for them to conduct higher-level research or writing. 807,000 which is about 3.8% of the eligible age group. Pakistan is facing a shortage of manpower in technical and vocational education as only 255,636 students are enrolled in 3,125 different vocational education and training institutes’ set-up across the country. According to the United Nations Educational, Scientific and Cultural Organisation (UNESCO) report, Pakistan presently had 64 technicians per one million population, while the same figure for the technically advanced countries was in the range of 1,500 to 2,500.